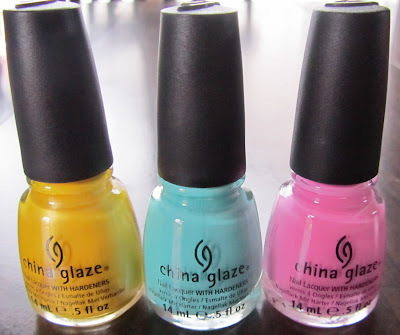 Polishology: China Glaze ElectroPop Giveaway! Prizes in this giveaway will include the gorgeous Sunshine Pop, Aquadelic, and Dance Baby polishes from the Spring 2012 ElectroPop collection! If you missed swatches you can see them here. I'm gonna keep this one super simple - just leave a comment below with your e-mail address and you are entered to win! Of course you must be a follower to join.... and I may tack on an extra entry for people who have previously been active on Polishology as well... :) This is just going to be a one week giveaway, and is open until February 28th at midnight. International followers welcome! Thank you!!! I am dying for Dance Baby! They look beautiful, especially Aquadelic! ooh thanks for the giveaway opportunity! that's an amazing giveaway! count me in? :) thanks! I love these little quickie giveaways! Awesome giveaway! I've been lemming over Sunshine Pop! Thank u so much for doing this!!! electropop is an awesome collection! Thanks for the chance to win these great polishes! I'm actually NOT entering.. just because I have these colors already! They are perfect and I'm sure whoever gets them will be thrilled! HI, the colors are beautiful! It even makes me want to try yellow polish! I know it's not a glitter-fest or flakie-coated, but I'm really liking this collection right now! This is such a great giveaway! That's so nice from you! I love these 3 shades, very cute and spring-y. Thanks for the giveaway! I follow you on gfc as belinda m and thanks for this awesome giveaway! GFC follower. Thank you so much, the colors are so vivid! I follow through google friend as 409cope. Gorgeous colours! :D Thank you. I am following you already & my GFC name is Sahrish Adeel. Thanks for the opportunity to enter your giveaway! What lovely spring colours! Yay for ChG! Thanks for the fun giveaway, Jenny. Superb, Thanks for the giveaway! Weeee! Thanks so much for sharing with us!! Great Colors!! I'm sooooo ready for summer!! I would loe to join in your Give-Away!! They were nice to let you keep the "mistaken" ones! Google Friends Connect, following you publicly as Käpsytin. I have to admit that I just found your blog, but I think it's amazing. =] I'm glad I found it. Yay! So excited for this givaway! eager to wear this with my Zoya Flakies as toppers! Howdy! Thanks for this! I'm Tonya Kaushik on GFC, and my email is tonyakaushik@gmail.com. Thanks again! Yay! A great giveaway with beautiful colors from a wonderful blog. This is an amazing giveaway. Good luck to everyone !!! Awesome giveaway! Found you through a friend of a friend. I'm sticking around! Thank you for the giveaway. I'm new to following nail blogs and yours is beautiful. I'll be following along on my Google reader.